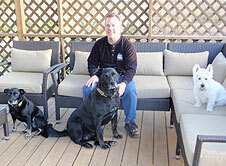 Just Dogs PlayCare, Inc., opened its doors on May 27, 2003, in a refurbished warehouse on 2nd Street in Coralville. Interest in this exciting new business grew quickly. The idea of doggie daycare as an industry was just a decade old, and we were one of the first to be licensed in the state of Iowa. Because Iowa City is such a dog-loving community, we were soon bursting at the seams. So in July 2006, Just Dogs moved into its current location in west Coralville, designed specifically as a dog daycare, boarding, and grooming facility. This climate-controlled facility features several indoor and outdoor play areas that allow us to separate dogs by size & temperament, keeping play & other interactions safe and fun for all. The key to JDPC’s success is our focus on small play groups. Just like we humans do not like every person we meet (and sometimes not always for a good reason), our dogs are allowed to feel this way, too! 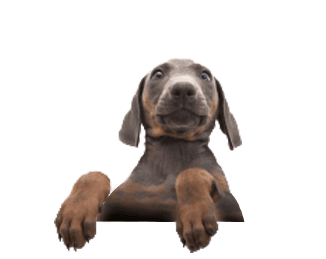 Our careful Intake Interview process and temperament testing help us figure out your dog’s likes and dislikes as well as other behavior & training issues. During a typical play day, we find it very helpful to move dogs through a variety of different activities and interactions each day, with rest periods in between. You wouldn’t expect your preschool child to be doing the same art project at 3 PM that he or she started at 8 AM. Similarly, our dogs need predictable routines, time to rest, time to think, and time to feel joy! Clockwise from left: Carol, Shade (RIP), Foxy, and Sunny. Clockwise from center: Brad, Blizzard, Rocco, and Sweet Pea. 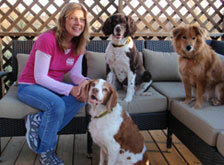 Just Dogs PlayCare is owned and operated by Carol Besler-Snell & her husband Brad Snell. Carol conducts all Intake Interviews to carefully and consistently assess dogs, teaches obedience classes, and trains JDPC Dog Handlers based on techniques of learning dog-to-dog communication. Carol received her BA from Loras College and MA from Southern Illinois University. After spending a dozen years in a career as writer, editor, and corporate communications & marketing manager, she left her career to start Just Dogs PlayCare. Having been raised on a farm with lots of dogs, Carol always felt an affinity to them. She also had an “initiation by fire” when Sunny, a very difficult but loving Brittany Spaniel puppy, entered her life in 1999. Reading books and taking classes with Sunny, Carol found her knowledge of dog communication expanding and eventually decided to follow her passion of working with dogs. The bonus: getting to be with her dogs at work every day! Much better than a desk job! Carol participates in ongoing dog behavior training, including seminars conducted by Brenda Aloff, a leader in understanding dog aggression and communication, & Sue Sternberg, an expert in assessing shelter dogs for placement. As a member of Pet Care Services and the Association of Pet Dog Trainers, Carol regularly attends conferences to learn more about dogs and the pet industry from dog communication pioneers like Turid Ruugas (calming signals) and Ian Dunbar (puppy training & bite inhibition). In recent years, Carol has been very involved in senior wellness care and death & dying issues—all part of the circle of life. ** Update: Brad now works full-time at Just Dogs PlayCare, so we are now a Mom & Pop Shop! The mission of Just Dogs PlayCare is to provide dogs with work and purpose. 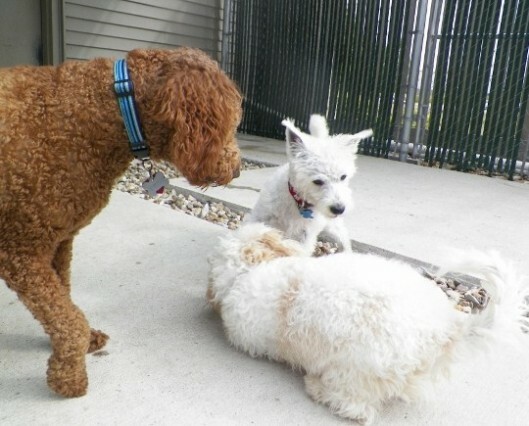 We give them things to do (play and learning) & come to understand and appreciate each dog for who they are. Just Dogs believes in gentle, kind, humane treatment of all animals. Our goal is to provide the best possible experience for dogs who attend our facility for any of our services, and we help accomplish that by being friendly, positive, and grateful that we are allowed to assist in each dog’s care. 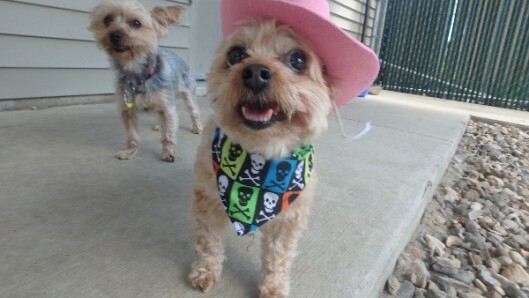 Just Dogs Playcare is licensed and regularly inspected by the Iowa Department of Agriculture. JDPC is also a member of the Association of Pet Dog Trainers. Locally, we support the Friends of the Animal Center Foundation and many other worthy service & non-profit organizations.